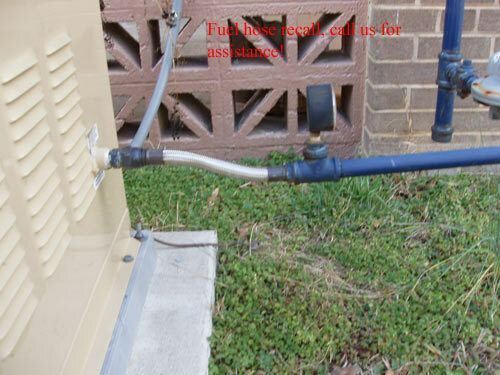 Generator service for Raleigh, Durham, Chapel Hill, and the Greensboro areas of North Carolina. 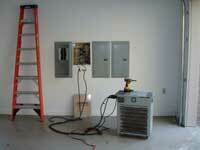 Choosing a company which specializes in power system service has several benefits. 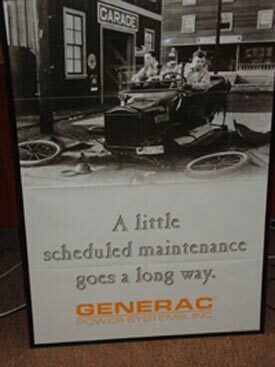 Generator service is more than just an oil change! Just because a generator cranks up every week for the set exercise does not mean that the generator is functioning properly! Most automatic generators have what the manufacturers call a weekly exercise circuit which cranks the generator once a week and runs for it approximately 15 minutes. This really does not exercise the generator, the unit must have attached loads in excess of 50% of output capacity in order to truly get exercise. Additionally if the loads are not changing in levels of current, then linkages nor electronic governors are tested or exercised! Alignment of engine flywheel in relation to starter motor gears is critical. This has been an issue for some units and if not found and corrected during the manufacturers warranty period, the cost could be quite substantial. There is a fuel hose recall for flexible fuel hoses used on some of the air cooled generators. These hoses will crack, especially if not installed correctly, and leak either high or low pressure gas. Exploding mufflers, calibrating the fuel pressure and ignition timing correctly can help to eliminate these type scenarios. Additionally just knowing the systems characteristics from an engineering standpoint helps as well. Microprocessors used to control functions of the generator sets constantly change due to minor programming issues indicated by hardware or software revision numbers. It is possible for a company to replace a bad board with a bad board. Only an experienced, seasoned generator specialist company would know the difference. Keeping up with the most recent software revisions as well as all new and obsolete parts is a big part of generator service! Cooling of the engines for generators is done by one of two ways, air cooled or liquid cooled. Air cooled generators require adequate ventilation and proper clearance from adjacent structures. Liquid cooled units have radiator and coolant systems similar to those in automobiles. Flushing the coolant system as well as replacing any rubber parts such as belts and hoses is important. 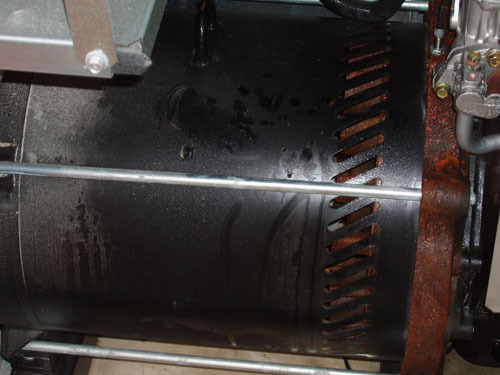 Electrolysis and corrosion can cause issues for radiator seams and freeze plugs. A block heater is a device which keeps an engine block at a certain temperature year round by heating the coolant of a liquid cooled engine. 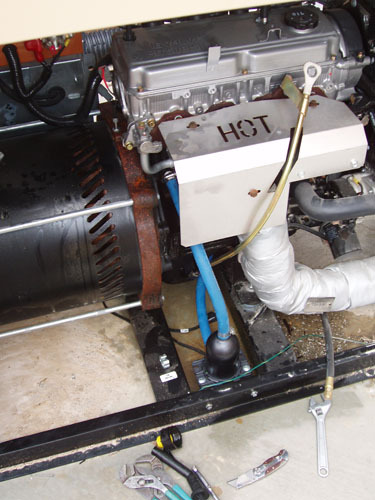 There is some misconception that generator engines in the southeast do not need block heaters because the temperatures during the winter do not get cold enough. Block heaters are used to help maintain block temperature not only for the viscosity of the oil but to also guard against condensation which can build up due to the big temperature swings during especially fall and spring. As metals heat up and cool down condensation can form in the engine lubricants causing them to break down and not afford as much protection. Block heaters are engine life extenders by protecting the lubricant properties and they also protect against rust and corrosion of the external engine parts as well. The rust in the engine adapter above could be prevented by using a block heater. There are weak links with any man made system, it is inevitable. Using a seasoned generator specialist company can be a great advantage for you. These specialist type companies would know common problems which may exist with manufactured product. No manufacturer is exempt from having an occasional problem and they rely on their partner companies in the field to identify correctly and then remedy the weak links. A specialist company which handles service or repair on several generators each day would be educated on what to look for in uncovering these weak links. We help you to keep the lights on thru proper and timely service, 365 days a year, 24 hours a day! 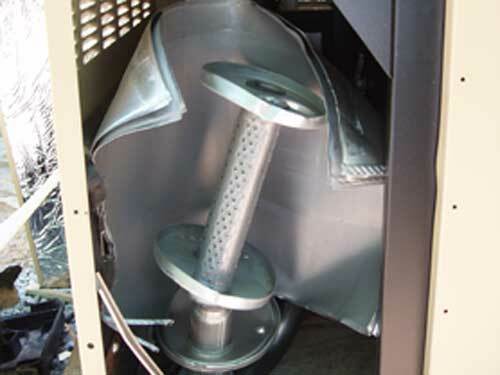 Load testing generators is must for properly servicing generators for a number of reasons. Most generators could realistically only perform the weekly set, automatic run cycles for approximately 15 minutes and never be subjected to a real utility outage event. Generators need to be worked, electrical load has to be pulled thru the stator or power windings generating heat which is good for eliminating condensation which can affect the insulation resistance of the power windings which in turn will effect the quality of the output electricity. Loads, especially those above 50% of output capacity of the generator also create heat for the coils or rotor used for the necessary magnetism. Additionally working the engine by applying different load stages helps to lubricate the rpm control linkages, exercise the diaphragm or valve plungers of fuel regulators, and also creates internal temperatures in the engine to burn off condensation. Load banking is absolutely necessary for the proper calibration of generator voltage and rpm control regulators before actual structure loads are attached to the generator source. If voltage regulators, governor controls, or the microprocessors which control system functions are changed out, this can not be done without external load banks. Load banking a generator is the only way to monitor fuel pressures at different load stages to insure the fuel plumbing supply is adequate to afford the generator enough fuel during worse case scenarios. Block heaters shown above with the blue heater hose attached to it come in several different sizes. The most common for generators up to 150 KW in size are the 500 and 1000 watt 120 volt units and also a 1000 watt 240 volt unit. Cost to operate these heaters is small compared to the savings they offer in extending the life of the engine. For a simple air cooled mechanically governed generator there are 7 calibrations which have to be made to insure the generator is functioning at its optimal level. Furthermore, any mechanically governed generator system requires calibrations in order to ensure proper function. These calibrations can not nor should it be attempted to calibrate the generator with structure load. A controlled and constant load is necessary for proper calibration. 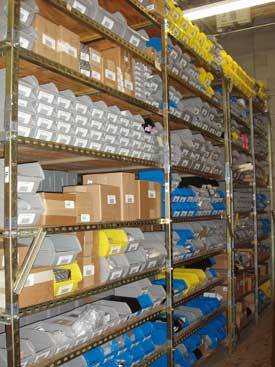 A good service plan should include load testing and calibrations on a yearly basis! For electronically governed systems the same would be true, calibrations have to be made! If correct calibrations are not made it will lead to shortened life span for generator systems, high or low voltage and hertz levels which will destroy any loads attached to the system, excessive fuel and operating cost, and excessive emissions. Generator systems have fairly complex wiring harnesses and connection of these wires is made by different type connectors. Loose or corroded contacts on switches, devices, or harness connectors can create havoc for operation of the generator system. It is important that attention is shown to these connections and that current is used to eliminate higher resistance values which can be created by oxidation or corrosion. Bad wiring connections are generally misdiagnosed leading to failure and expensive repair cost. Using seasoned generator specialist companies to service your system is your best defense against this potential threat. Keeping accurate record of data collection is key to some diagnosis. Accurate history also will expose product engineering flaws so that correct action for repair is possible. Experience, knowledge, practice and attention to detail are required for implementation of comprehensive service for generator systems. Automatic generators have been around for awhile however most of the demand has been for commercial and industrial applications. The required commitment in offering correct generator service is quite large so there have not been a lot of companies to step up and use their resources towards providing a complete generator service. Recently however deficits in our utility power supply combined with catastrophic weather events has fueled a growth in demand for automatic generators, for the residential markets. This in itself created new obstacles for the consumer, inexperienced generator dealer networks providing incorrect and incomplete services. To make things worse most manufacturers, focused mostly on the residential sector, flooded the markets with equipment before putting into place qualified companies to maintain the systems. By doing so, it created additional obstacles for the few companies who were making commitments in providing a complete generator service to the consumer. By allowing unqualified companies to sale and install the systems without regard for correct and complete service it took sales away from those companies making the commitment, in return, basically cutting the legs out from under truly qualified, knowledgeable generator specialist companies. WE CAN HELP! We made the commitment 16 years ago and constantly work to be ahead of our competition in understanding the theories which support generator systems. This commitment combined with 16 years experience in power systems affords us the knowledge necessary in providing efficient and comprehensive generator and alternative power system services. Repairs, correct and timely are critical for generator systems and it requires not only a full understanding of the theories at work in delivering a quality back up power supply but also the required parts. Our service trucks carry 605 different generator parts so having the correct part for a repair is generally not an issue. Additionally our technicians are trained in house to diagnose generator problems using their understanding of electrical and mechanical theories, not in only knowing how to follow manufacturer diagnostic loop sheets which do not always cover all the possibilities. Our technician also train at manufacturer facilities in order to keep up with the changing technology which make up the generator systems. Basically we can make any type repair to the generator, tearing it completely apart and putting it back together if necessary. Complete maintenance service plans will reduce failures but all man made objects break so knowing how to efficiently repair the machines is key to providing full generator service. Load banking with an external load bank should be part of any generator service plan and should be performed once a year. This will stress the generator for true exercise and uncover any possible problems with the system.